Why Choose a Navien Tankless Water Heater? You don’t normally think about your water heater – not until you run out of water or your water runs cold. According to Natural Resources Canada, an average Canadian home uses 75 litres of hot water every day for bathing, cleaning, washing clothes and dishes. Water heaters account for 19% of the energy used in the average Canadian household. It is the second largest portion of the energy utility bill after space heating. More and more environmentally-friendly, internet-connected, budget conscious and convenience conscious homeowners are turning to Navien tankless water heaters. 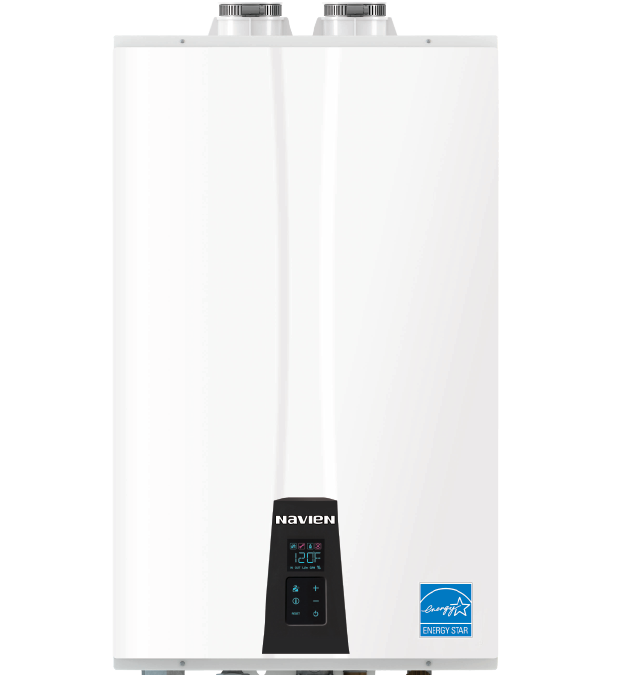 A tankless water heater, also known as an instantaneous or on-demand water heater, provides hot water only when it is needed. A tankless water heater is just one type; the other types of water heaters include storage tanks, heat pumps and solar domestic hot water systems. These different types of water heaters can be powered by either oil, gas, propane or by electricity. Step 1: When a water tap opens, the Navien tankless water heater detects the flow. Step 2: The unit’s flow sensor activates to establish the amount of hot water needed. Step 3: The igniter activates. Step 4: The gas control valve opens to supply the right amount of gas. Step 5: The fan and venturi activate to provide the right amount of gas and fuel. Step 6: The premix burner ignites, providing a flame to heat the water. Step 7: The tap water begins to pre-heat in the secondary heat exchanger. Step 8: The pre-heated water moves to the primary heat exchanger from the secondary. Step 9: The Navien tankless water heater determines outgoing set temperature and adjusts the flame that heats the water. Step 10: The heated water moves to the buffer tank. Step 11: The desired hot water amount is then delivered to the faucet. When purchasing a water heater, two price tags have to be considered: the purchase price and the operating cost. What good is a cheap, brand new water heater if the long-term operation cost can ruin your family’s regular budget? Based on the annual estimated residential use per the US Department of Energy (DOE) test criteria of $1.09 per therm of natural gas, the annual operating cost of a Navien tankless is $191; the annual operating cost of other tankless water heaters is $228 and $293 for a 50-gallon tank water heater. Because water is only heated when needed in a tankless heater, the continuous standby losses that are associated with storage water heaters are eliminated. This makes tankless water heaters more energy-efficient than a storage tank water heater. The Navien tankless water heater also saves you money via its exceptional warranty, greater longevity, credits and rebates. Navien tankless water heaters offer the industry’s strongest warranty – 15 years on the heat exchanger. You’re assured of an extended lifespan of the unit as Navien was the first company to offer dual stainless steel heat exchangers instead of copper – extending the life of the water heater. Once you purchase this water heater, you may qualify for credits and rebates, depending upon your location. The Navien tankless water heater is eco-friendly. This unit is environmentally-friendly as it only fires up when hot water is needed. This results in utility savings and a lower impact on the environment. According to the US Energy Information Administration (EIA), compared to conventional storage type heaters, a Navien tankless water heater reduces the carbon dioxide (CO2) output by 1,216.8 lbs. annually. This is comparable to saving 62 gallons of gasoline in your car. With Navien tankless water heaters, you won’t have to worry about running out of hot water; this unit delivers a continuous flow of hot water for as long as you need it. The Navien tankless water heater also eliminates the need to wait for the water in a storage tank to warm up, which is associated with storage type water heaters. In particular, the Navien NPE-A tankless water heater offers ComfortFlow – a technology that eradicates cold water shock, which is typically associated with other tankless water heaters. This unit can provide an endless supply of hot water on demand as the unit is activated the moment you open the hot water tap. Every time you turn on your shower, faucet or other water outlet, this water heater will automatically detect the flow and start delivering the desired hot water. The Navien tankless water heater provides peace of mind with “NaviLink” – a Wi‑Fi remote control system that allows you to check your Navien heater from anywhere in the world. The NaviLink module can be easily attached to the Navien water heater. Once the NaviLink module is installed, download the NaviLink app onto your smartphone or tablet. You can then control temperatures remotely, access usage data and receive diagnostic notifications.